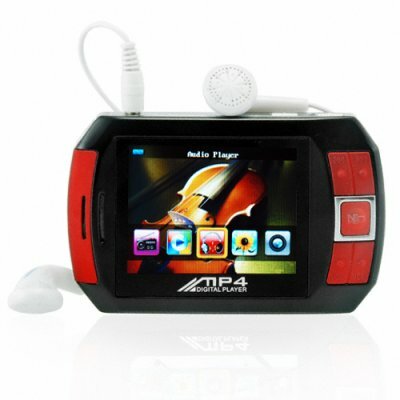 Successfully Added 4GB Portable Media Player - PMP with Video, Music, Camera, Games to your Shopping Cart. 4GB PMP with 2.4 inch TFT LCD screen and built-in digital camera. Often called an MP6 player (MP3 + MP4 + MP5), this is a fun digital media player with NES emulator and easy-to-use media menu navigation for maximum interactive enjoyment for any kid! Watch MP4 movies and video at a beautiful 320x240 resolution. Or load it up with all your favorite MP3 or WMA music files and put on your headphones to listen to the digital sound. Add to that the picture viewer, digital video recorder, and e-book reader and you are covered for anything with this personal digital entertainment device. And if that is not enough, take sharp 2.0 megapixel pictures with the built-in digital camera. What more can you ask for? Chinavasion Wholesale offers this pocket sized PMP with an unbelievably low wholesale price and a 1-year warranty. Whether you are buying this for the resale market, OEM market, or for a gift for your favorite youngster, you are getting an good portable media player for a much lower price than the cost of many other compact PMP's with just some of the same features. Hi Jagoda. Every digital media player on our website will work for USB charging with any computer (Windows, Mac, Linux). For file transfer this model should work with any Mac that has OS X+. Thank you for your question. Does it work on Mac???? IT a Nice product very easy to use and its compatible with every software really good thing. on 2009-05-10 23:57:33 looks good on picture will make a perfect gift. The perfect all U want in an mp4 player, with the youths of today now into music and videos, i'll say this is the way to go, and the price no bad, keep it going Chinavasion. on 2009-04-25 22:33:28 Good product, people you should buy it. The product is really good, it is better than other products that you spend lot of money on but you still get disappointed on the product. However, this product is cheap and function well that all the expensive product out there.